Iron oxide, a common colorant in clay and glaze is also prevalent in the toners of many laser printers. Hewlett Packard ink cartridges, for instance, contain up to 60% iron oxide. Iron oxide helps the toner hold its magnetic charge on the printer’s drum. The iron oxide, heat-resistant enough for the laser printing process is also resilient enough to handle the high temperatures of a ceramics kiln. The toner’s other pigments and fillers burn off, leaving the iron oxide to decorate the ceramic piece with rich dark brown designs. Applying decals. Decals go on black and fire to a dark brown. Create a print-ready document with desired images. Print from laser printer onto decal paper (remove tissue paper if any is attached; print on the shiny side). Cut out image from paper close to the edge. Dip image in bowl of water and wait till paper softens. 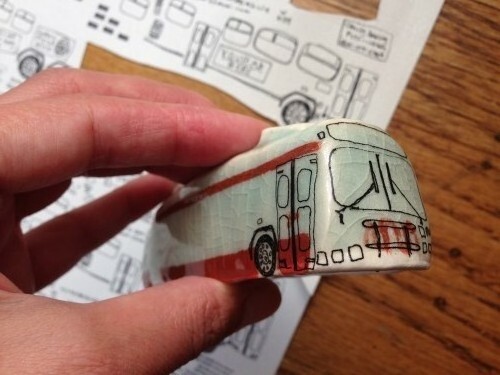 Slide the image off its backing paper and onto your ceramic piece. Insure decal image is flat against glaze-fired ceramic piece (no bubbling or puckering). Fire in an electric kiln. I use an old Hewlett Packard laser jet (HP 4100 DTN). Frank Gaydos’s article below cautions against NEC and Brothers printers. 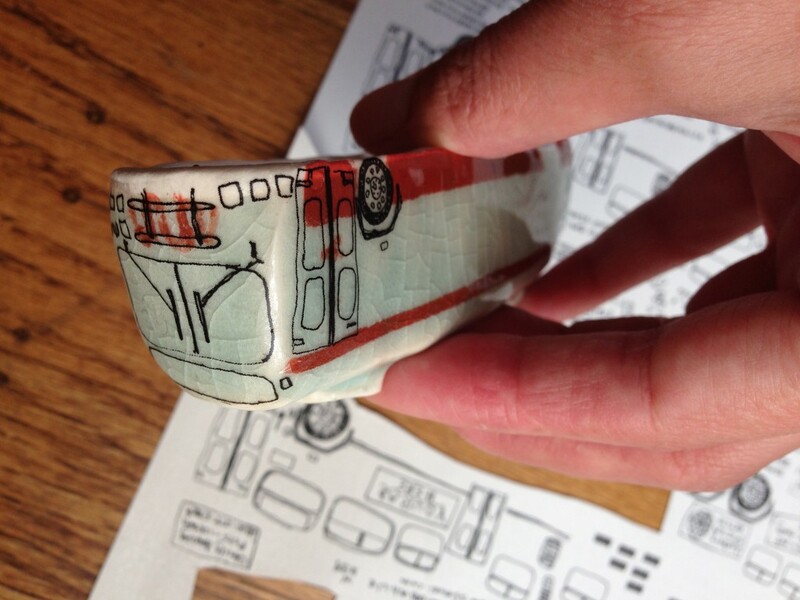 Decal firing temperature varies depending on glaze firing temperature. You want the glaze to flux a bit, but without absorbing the decal. I glaze fire to cone 10 and decal fire to cone 1. Glaze consistency sometimes changes in the firing. Testing is the best way to see what works for you. Arbucke’s experience is that clear glazes with high Gerstley borate or nepheline syenite tend to “eat” the image. Rothshank notes that glazes with iron as the main colorant (celadon / temmoku) do not remain consistent (I use celadon and have good results about 80% of the time.) and glazes with tin can be prone to pinholes.